Eric "Outlaw" Hunter, 21-3, 11 KOs, is working hard to prepare for his IBF world featherweight title shot against Welshman Lee Selby, 22-1, 8 KOs. The 12-round bout is scheduled for London's O2 Arena on April 9th, and will be broadcast in the USA by Showtime. This is the title fight that many predicted Hunter would never land. 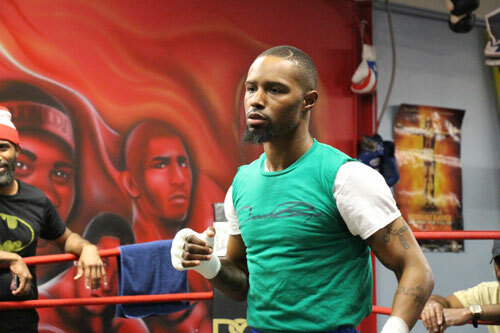 The brilliant West Philly fighter has had a rocky road outside the ring, with long spells of inactivity and a revolving door of promoters, managers, and fickle supporters. On April 9th, Hunter plans to show them all that the great promise surrounding him at the launch of his pro career was not squandered in the up-and-down decade since his 2005 debut. Back then, he was an outstanding amateur who was being touted as the next big thing in boxing. Hunter piled up wins but gained no ground in his career. Big victories, like his decision over then-undefeated Jerry Belmontes, never led to bigger bouts. Instead a self-proclaimed "black cloud" followed Hunter around. His three losses were hard luck examples - two disqualifications and questionable decision. However, Hunter just kept fighting and working, despite many disappointments and seemingly lost opportunities. Miraculously, Outlaw was recently named the mandatory challenger for IBF champ Selby, and thus Hunter's long-awaited chance to prove himself on the world stage finally materialized. Had it not been for the mandate, surely Hunter would still be waiting. I visited Hunter in the gym to watch him spar and discuss his upcoming fight. He appeared focused and calm, and seems ready for the Selby fight, which will be certainly prove to be the enigmatic fighter's moment of truth. 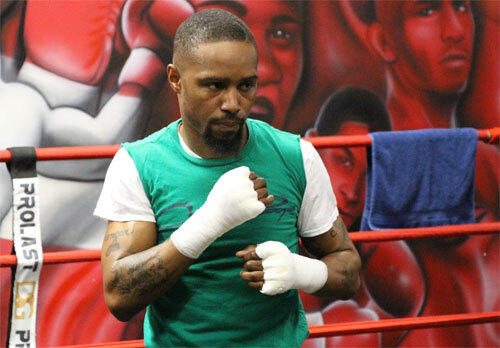 A win will put him in the rarified air of Philly fighters who made it to the top. A loss will banish Hunter to the list of under-achievers from the City of Brotherly Love. Perhaps as many haters will be rooting for Eric to fail as his true fans will be hoping for his success in the fight. Either way, Hunter has landed the big fight and will get his chance to compete for the world title. It's a moment that he - and his fans - have been patiently waiting for since the beginning. I will post a full interview with Hunter and preview of the fight April 9th approaches.